For this year I chose my project of “CarBeat” to be my self initiated game which was a drag racing game, this was to focus on up skilling my 3D modelling skills especially in the automotive/ vehicle area. To evaluate that in achieving my goal I definitely did, the Maserati Gran Turismo I did at the end of the project was by far my best piece to date and will be a sure feature of my portfolio. The game as it is with a little more time will have alot more very soon, I modeled 5 vehicles (3 done, 2 unfinished) and only 1 currently sits in the game. I designed a garage level so that the player could select their cars and make modifications etc which is yet to go in and needs the blueprints side to be made. As well as many assets and other features I plan to implement, the current game in engine is basically a fragment of the game I am creating. To reflect personally on this side of the year I didnt allocate enough time to it, with the client project I dedicated alot of my time towards that which neglected my self initiated work. 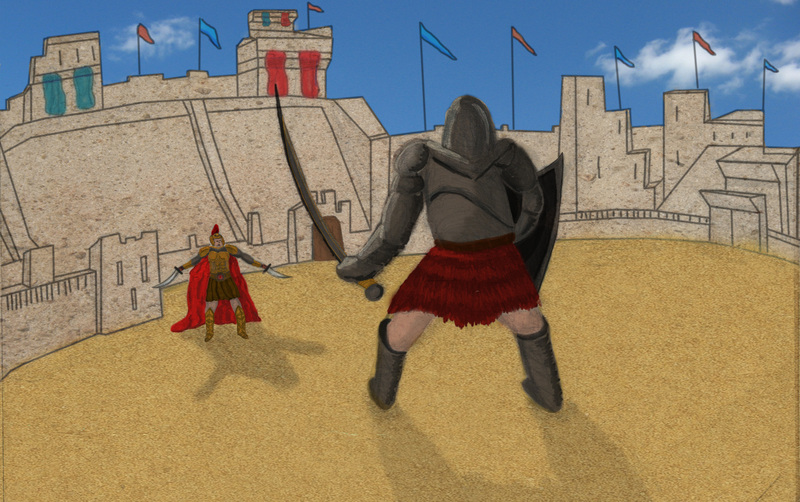 The demand for work to push the client project along caught me and therefore my game suffered. Next year to reflect upon this I will devise a time management weekly schedule, this will for example be Monday-Tuesday for client, Wednesday-Thursday for final major project and Friday-Saturday for CATS with Sunday as a relax day. By doing this and working on average 6+ hours a day I will effectively produce work for all areas adding efficiency to my workflow. I am pleased with the progress I have made in my technical abilities for the software in 3D and UE4, I am no blueprint genius but I do understand it to a certain extent allowing me to make game mechanics. The work I have done for my self initiated project I no doubt believe could have been much more, I enjoyed working on my own project but didnt allow myself enough time aside of the other course work to really hit all my targets for the project. 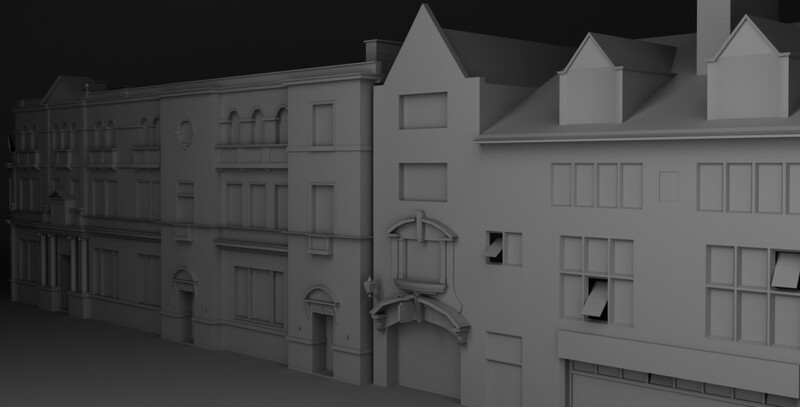 My primary goal was to focus on 3D and produce realistic vehicle models was a success in my opinion but as for my secondary goal of building an environment and having a fully working race (start, race, end, repeat) I did not achieve, they are well underway but not completed. Then my tertiary goal to texture my work was missed, which disappoints me as I need to focus on gaining knowledge in texturing due to my 3D work being more advanced I feel texturing and unwrapping is a side I currently need to apply more time to learn it. In conclusion I am satisfied with my project but fell short on my secondary and tertiary goals for the project. Going forward into next year and the summer I will plan up a time management sheet to try stick by for next year, I will continue to model vehicles as this is where I feel my best features are in 3D, and to take time to up skill in unwrapping and texturing so I can have the realistic visuals to the models. I intend to use this project to take into my 3rd year so that I have a more complete portfolio piece at the end of my 3rd year, this will be my aim but is yet to be approved. Categories: Self initiated, Year 2 | Tags: 3D, Car, CarBeat, Cars, Design, Design Process, evaluation, Maserati, PHASEgaming, Portfolio, Professionalism, progress, Project, reflection, research, Vehicle | Permalink. What aspects of the process – artistically or technically – prompted the greatest satisfaction and why? In this process my greatest satisfaction was finishing my final concept art piece, due to this being the piece i left until last and worked the hardest of the level of satisfacion was much more than the rest of the work. Also the concpet art was done in Photoshop, i have been trying to increase my skills in Photoshop across the year and especially recently over the easter whilst making final touches on work so having a piece come out as nicely as i felt it did was very satisfying. I used textures for the floor, stadium and sky aswell as hand painttextures for extra detail or shading so it was a real bonus when done. i also enjoyed the write up of my story enjoying literature at A-level played its part there. What aspects of the process – artistically or technically – posed problems or difficulties, and how were they resolved? For adaptation id say that again the concept art was the hardest i had layering issues to begin with when applying textures and making sure i had multiplied one layer to overlay another to get the effect i wanted required alot of tweaking and experimenting, it wasnt just a paint and done project it took alot of time and really testing my artist eye for detail and colour. Other aspects would have been the storyboard, i am unfamilar with storyboarding and have not personally drawn them alot so this was a difficult task for me as a storyboard should speak for itself and trying to make mine portray that was harder than expected. 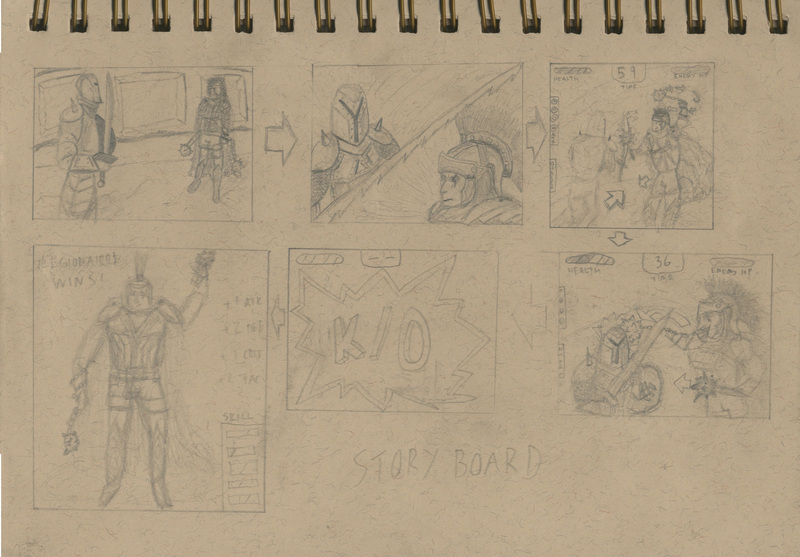 I resolved the storyboard issue by researching into storyboarding gathering references to see how a fight scene (my focus) would be storyboarded, this helped alot and my final storyboard was a good one. As a consequence of thinking about these former questions, what can be identified as the core strengths and weaknesses of the approach to and execution of the project? Well my strengths in this prject was definately the visuals and ideas i was generating, the thought process behind it and level of research really put me on the front foot to begin with acting as a platform for the rest. Then by tackling each part one by one i felt i got work out of the way instead of half done then moving onto the latest one given instead it was done then i progressed. And finally the time and effort put into the concept art piece was pleasing especially with the outcome. Weaknesses would be that i didnt digitalise alot of my work which would have been better in some cases, for example the character design sheet in multiple views would have been great done in photoshop aswell as the storyboard. So my approach to moving my artistic drawings into digital work wasnt as good as it should have been as the concept piece was the only one and looked the best by far. What are the key strengths and weaknesses of the final outcome of the project? What aspects have been successful and why? If it was possible to change something, what would it be and why? The strengths was my final concept piece, also the drawings i did for props, environments and characters i felt was very strong. Weaknesses would be not enough digitalised versions of those drawings limiting my range of work in some areas to just sketches. The successful aspect of the project was how i tackled it one by one not moving on until i have finished the previous one and then later i added to previous ones when i had the time e.g. props i did helmets orignally then i moved onto characters but came back to armor,gauntlets and boots. If i was to change anything about my work it would be that i would have given myself more allocated time for digitalising all my adaptation work to show before and afters from drawings to digital currently i can only do that for the concept piece. What set of “recommendations” can be drawn from evaluating the project, which will be useful on another occasion? i would recommend myself to be more experiemental and not avoid using programs i may not be used to, when i did adaptation photoshop was fairly new to me so a digital version of most things was something i put off when i did my concept later on i had gained skills in photoshop from my tutors in lectures so that showed alot of progress but i never went back to do the others. other than that i felt i tackled the brief well. Categories: Creative Futures | Tags: Adobe Photoshop, art, Brief, Creative Futures, Creativity, Design, Design Process, Drawing, evaluation, Gladiator, ideas., PHASEgaming, progress, research, Rome | Permalink. A Year Long Drawing Experiment. Learning animator, illustrator, designer, grown-up.